Victor Moses is a professional footballer loved by many Nigerians. He plays in one of the top clubs in the Premier League, Chelsea, as well as the Nigerian national team, The Super Eagles. Nigerians are often proud of their own who are doing well in the international scene and Victor Moses presents many things to be proud of. Below you can get a fuller picture of this beloved sportsman. The beloved footballer was born on the 12th of December 1990 in Kaduna, Nigeria. The unfortunate event of the death of his parents when he was 11 years old led to him seeking asylum in Britain. Some of his relatives paid for his travel to Britain where he went on to attend Stanley Technical High School which is now known simply as South Norwood. Victor Moses was discovered by a football scout while he was playing in the local Tandridge League for Cosmos 90 FC. He was approached by Crystal Palace whose Selhurst Park Stadium was not far away from his school. Crystal Palace recommended that he go to Whitgift School in Croydon despite him being offered a place in the Eagles’ academy. Whitgift was then being coached by Colin Pates a former Arsenal and Chelsea star. At Whitgift, Victor Moses won numerous school cups. He, however, rose in prominence at the age of 14 when he scored 50 goals for Palace’s under-14 side. His performance soon caught the eye of Wigan Athletic and he made his Premier League debut in 2010 after a £2.5 million transfer for him was completed. On May 3, 2010, he scored his first goal for Wigan Athletic. His move to Chelsea happened on 24 August 2012 after he caught the club’s eye at the DW Stadium the weekend before. He was loaned back to Wigan and that was followed by three Premier League loan seasons – to Stoke City, Liverpool, and West Ham – before he finally found a place as a member of the Chelsea’s first team setup. The player has come a long way since then showing himself as an invaluable team member. On Boxing Day in 2017, he reached 100 Chelsea appearances against Brighton. In March 2017, Chelsea showed their appreciation for Victor Moses’ form by giving him a two-year contract extension which now takes his contract with Chelsea to 2021. Victor Moses was indeed in top form. He played 34 out of the 38 games that led Chelsea to the title and actually started in 29 of them, scoring three league goals. Despite appearing for England from his days as a schoolboy up until the under-21 cadre, Victor Moses switched it up at the international level in 2012 when he chose to instead represent Nigeria at the senior level. He made his debut for Nigeria in February 2012. By the end of the 2013/2014 season, Victor Moses was named as one of the Nigerian squad members leading up to the World Cup. He then went on to play in all of their matches as Nigeria reached the second round. He continues to show an unflagging zeal for his birth country even in the FIFA World Cup 2018. He has come down regularly to help his country in the qualifying matches. 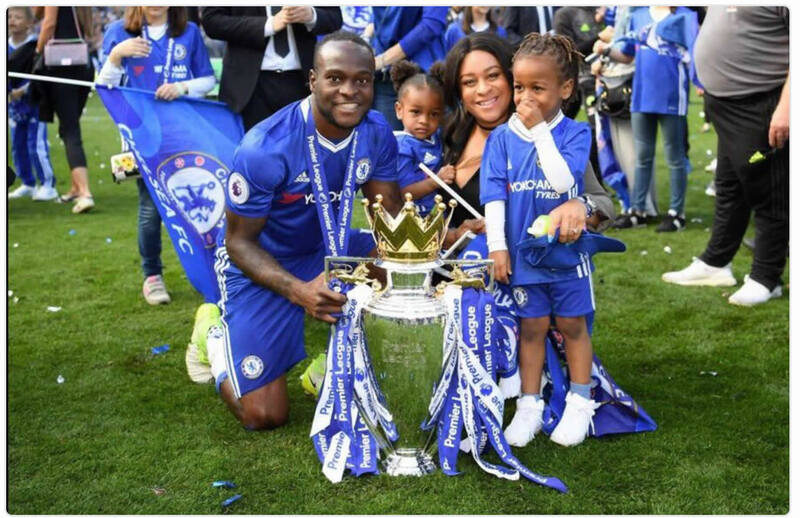 Victor Moses was born to a pastor and his wife named Austine Moses and Josephine Moses. As a young boy, he was already in love with the game of football. Unfortunately, at the age of 11, one of the days he went out to play with friends was tainted by tragedy. He returned home to find that his parents were dead. It has been said that they were killed during a Christian/Muslim riot. Victor Moses stands at a height of 1.77m (5 ft 10 in) and weighs 77 kg. As a footballer, it is necessary that he remains in shape and the rigorous training schedules as a player in one of the top premier league clubs ensure this. In 2012, Victor Moses had a son named Brentley. In 2015, he was blessed with a daughter who he named Nyah. In May 2017, he married the mother of his two children in London. The wedding came 24 hours after the FA Cup final when he was sent off in Chelsea’s 1-2 loss to Arsenal. The wedding was recorded and shared online by a London-based Super Eagles fan.